This is one of a very few wallpapers showing winter-related motifs. 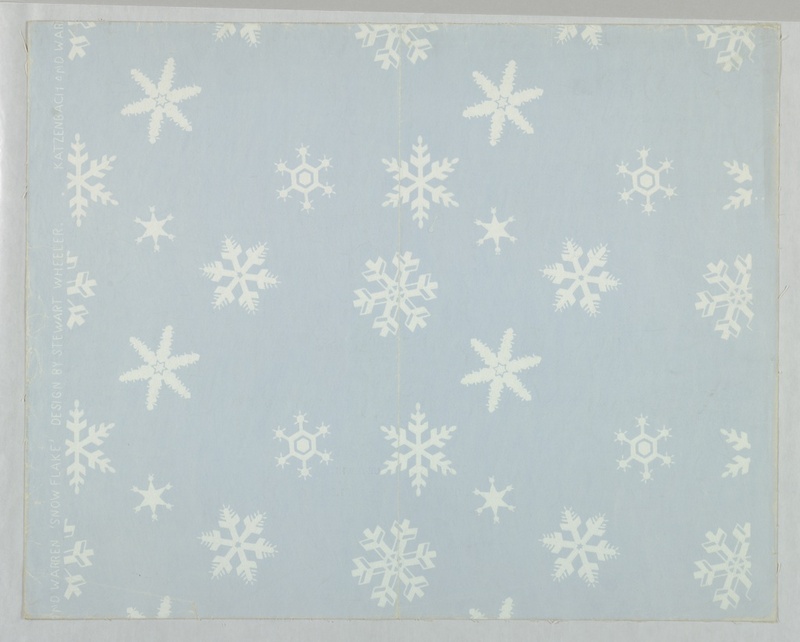 The design contains six different snowflakes that repeat twice across the width of the paper. This pattern was introduced in 1929 and is designed in a modernist style. Even today it still looks fresh and modern, printed in a single color on a solid blue background, with a good amount of space between each of the motifs. The only other winter-themed wallpaper that comes to mind is Robins and Crocuses by Charles Burchfield, which illustrates the early spring flowers popping up against drifts of snow. And possibly The Birches, also by Burchfield, when printed in the cooler blue colorway. As the designer’s name is printed in the selvedge I will assume this is by Stewart Wheeler, the American painter and printmaker, though that is strictly conjecture on my part. I found no documentation supporting this. But usually the artist or designer name was printed on the paper as a marketing tool, which wouldn’t serve much purpose if the artist or designer was unknown. I’m not that familiar with Wheeler’s artwork which seems to be mostly landscapes and still lifes, but this “Snow Flake” wallpaper seems to be a shift from his normal repertoire. This pattern appears in the first collection of wallpapers introduced by Katzenbach & Warren in 1929, where it is shown in seventeen different colorways. The pattern doesn’t look quite so winterly when printed in the warmer colorways, where some of the snowflakes start appearing like starfish. This just seemed like an appropriate wallpaper to blog about now that winter is upon us, though I have to say, I’d be more inclined to select a beach theme or a nice floral pattern. If you live in the mountains , if it is snowing you might like to keep the mountains mood even during the summer ? And if you don t live in the mountains, why should you have flowers or palmtree on the wall? Dont you think it is a matter of culture and mood ?